- Spoonerisms (initial sounds of words are switched, i.e. Smart Feller, Fart Smeller. These word play concepts could have been fun all by themselves, but Jon Agee brings so much more with the illustrations that accompany each idea. These illustrations helped my children understand the word play concepts and got them very excited about words! By far, our favorite word play concept was palindromes. Jon Agee described his introduction to palindromes in the video interview posted below, "I was at a restaurant with a friend and he drew in my little notebook some palindromes. I thought I can do a better palindrome than he can. So, I started to do one, then another, then another. I couldn't even read a book without wanting to turn words into palindromes." 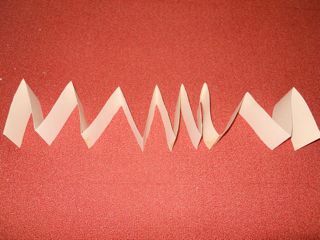 I used a large piece of construction paper, folded in fourths, and then cut the strips. 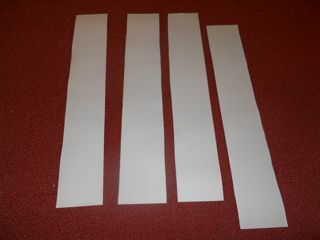 I taped the strips together and then folded the paper into an accordion using directions from Kids At Art.com. I then wrote a letter on each tile vertically. I added 2 geese illustrations because I had extra tiles. 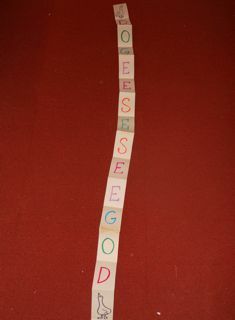 I also color coded the letters in my palindrome - the first and last letter were the same color and so on. This week is National Turn Off Your TV Week (April 18-24, 2011). I hear that in many households, it has been expanded to "no screens" too. Many of Jon Agee's books would provide your family with an evening of fun. 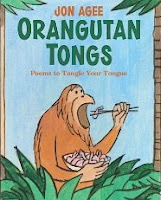 Last night, we spent well over 30 minutes reading Orangutan Tongs: Poems to Tangle Your Tongue. We took turns reading the tongue twisting poems. We laughed at each other when the words came out all wrong. It was a blast trying to say some the more complex sentences three times fast. I think my daughter was best at reading the poems, but my son wins the award for the best laugh! Click Here to Listen to the Orangutan Tongs song by the Promise Makers (from Jon Agee's website). Jon Agee interview - March 2, 2011 from Regina Ziffer on Vimeo. Word games are fun! You've inspired me to try some with my kids!